ince 1981, David Lasky has been Organist and Director of Music at Saint Cecilia Catholic Church in Leominster, Massachusetts, and resides in Hartland, Vermont with his wife, Pamela Kozlowski Lasky. Prior to that he served as Organist and Director of Music at Saint John Church and School in Bartlesville, Oklahoma, and as Organist at Holy Spirit Church in Gardner, Massachusetts. He earned his Bachelor of Music degree in Music History and Literature at the University of Massachusetts at Lowell in 1979, and earned a Master of Music degree in Organ Performance, also at UMass/Lowell, in 1981. In 2005, he earned his Master of Arts degree in Church Music and Liturgy from the Rensselaer Program of Church Music and Liturgy at Saint Joseph College, Rensselaer, Indiana. Mr. Lasky has performed as an organ soloist and in ensembles throughout Massachusetts, and has performed recitals at Washington National Cathedral and the Basilica of the National Shrine of the Immaculate Conception, both in Washington DC, and at Saint Mary Cathedral in Lafayette, Indiana. He has taught classes and workshops on improvisation and service playing for the American Guild of Organists and for the National Association of Pastoral Musicians. 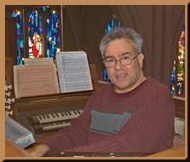 In addition, David Lasky is very active as a composer and arranger of sacred organ and choral music, with about 375 pieces of music published by Warner Brother Publications; Randall M. Egan, Ltd.; Augsburg Fortress Publications; The Sacred Music Press; GIA Publications; Wayne Leupold Editions; and MorningStar Music Publishers, in addition to CanticaNOVA Publications. His music, which is widely performed in churches throughout the United States, Canada, and England, has been favorably reviewed in the professional organist journals The American Organist and The Diapason, as well as in the British journal, Church Music Quarterly and in the American worship magazine, Creator. In 1992, Mr. Lasky won a national hymn tune-writing competition, sponsored by the Lutheran Home for the Aged in Arlington Heights, Illinois. In 1994, he was commissioned to compose a concert work, Variations on Austria, for the renowned organist and long-time head of the organ department at The University of Michigan, Marilyn Mason. He has also accepted commissions from Worcester (Massachusetts) State College; Christ Church (Fitchburg, Massachusetts); Saint John Episcopal Church (Charlotte, South Carolina); the Tappan Zee Bridgemen Brass Ensemble (New York City); Jane Errera (Saint Anne Catholic Church, Bethlehem, PA); King’s College (Wilkes-Barre, PA); the M.I.T. Concert Band; the Market Street Presbyterian Church (Lima, Ohio); and David Tierney for the Rivers School Conservatory in Weston, Massachusetts. In 2010, he was one of eleven winners in a composition competition co-sponsored by Region IV of the American Guild of Organists and Wayne Leupold Editions. Most recently, he was commissioned by the Boston Chapter of the American Guild of Organists to compose a piece for the 2014 National Convention of the American Guild of Organists. From 1985 to 2005, Mr. Lasky served as a classical music reviewer for The Worcester (MA) Telegram & Gazette, and has written CD and composition reviews for The New England Organist. He taught as an adjunct professor at Quinsigamond Community College in Worcester, Massachusetts (1989-1990), and in the Music Theory department at the University of Massachusetts at Amherst (1991-1992).